This is a guide for lawyers handling Maryland District Court claims for $30,000 or less. It is also a good read for people who are trying to handle their own claims in Maryland District Court. If you are an injury victim who wants to understand how the Maryland District Court process works, you can click here for information about the district court process written for accident victims. The District Court has original jurisdiction over civil matters where the damages claimed are $30,000 or less. Md. Code Ann. Cts.&Jud. Proc. (“CJP”) § 4-401. Although the District Court lacks the extensive formal discovery process available in Circuit Court, it is important not to allow this perceived lack of formality to diminish our trial preparation and presentation to the District Court bench. Although the damages claimed may be smaller than those of other matters, these cases are important to our clients, and we owe them our best efforts when presenting their claims. This article will presenttrial practice tips designed to maximize the recovery to our clients and increase the level of professionalism of the District Court bar. I am sure many of us have had the excruciating experience of sitting through a District Court trial conducted by a lawyer who is unprepared or unfamiliar with District Court practice. This diminishes both the professional reputation of counsel and the potential recovery to his or her client. The practice tips contained below are designed to foster an effective, organized, and professional trial practice in the District Court of Maryland. A small claim is any matter in which the amount in controversy is $5,000 or less. CJP § 4-405. Forms for pleading small claims are available from the clerk and should be used in filing and defending such actions. Md. Rule 3-701 (b). Using these forms can save considerable time . Further, the clerk’s office’s inherent familiarity with the forms helpful in getting cases timely and correctly set for trial . Most District Court forms are available as fillable .pdf files directly from the Maryland Judiciary website. The required information can be typed in and printed directly from your computer, ready for filing. Happily, the days when District Court forms required a typewriter and carbon paper are long gone. Additionally, small claims are unique in that no discovery is permitted, Md. Rule 3-701 (e), and the Rules of Evidence do not apply. Md. Rule 3 -701 (f). It is the wild west which is probably how it should be since so many of the participants are pro se plaintiff who are not going to understand the Maryland Rule of Evidence. However, often if there are counsel on both sides, the Court will require the rules of evidence be applied, so it is best to be prepared to present your evidence in accordance with the Rules, should it be required. Claims from $5,001 up to $30,000 occupy the “no man’s land” between the extremely informal small claims procedure, and the formal procedures used in Maryland’s Circuit Courts. Fortunately, there are myriad ways to present your case effectively even within the constraints of the District Court trial format. Presenting Medical Evidence Under CJP § 10-104. It is possible to admit medical bills and records without witness testimony using the procedure set forth in CJP § 10-104. This has been a wonderful cost and time saving device for personal injury lawyers and defense lawyers in simplying the handling of personal injury cases. Although to many this practice may seem routine, the requirements can be technical, so a little extra attention is well spent. Usually in District Court injury cases this type of evidence makes up the bulk of the damages evidence that will be presented to the court, so the consequences of a procedural error can be particularly dire. It allows the bills and records of a health care provider to be received in evidence without witness testimony, as long as the requirements of the statute are met. Section 10-104 may be used in any action for personal injury, medical or disability benefits, first party auto insurance, or first party health insurance benefits brought in the District Court (or in the Circuit Court where the amount in controversy would be within the original jurisdiction of the District Court ). CJP § 10-104. This requires that a Notice of Intent to Introduce Writings and Records Without Support of Testimony be filed with the Court and served on all parties at least sixty days before the trial date. CJP § 10-104 (c)(1)(ii). The Notice must contain a list stating the name of the health care provider for each writing or record and the date of each writing or date of each treatment. CJP § 10-104 (c)(3). In order to ensure compliance with the sixty -day deadline , I suggest serving the required notice and supporting documentation along with the complaint. This ensures that the trial date will not be set too early to comply with the sixty-day requirement. The documents will then be admissible without the need for testimony. CJP § 10-104 (d)(1). The fact -finder may assign this evidence any weight it deems appropriate. CJP § 10-104 (d)(2). Medical bills presented using this procedure are not required to contain a statement as to fairness or reasonableness. CJP § 10-104 (c)(1). Click here for more on using a 10-104 in Maryland. Presenting Evidence of Paid Bills for Goods or Services Under CJP § 10-105. Similarly, a witness from a provider of goods or services is not required to admit into evidence paid bills or receipts for goods or services in civil actions in the District Court (or in Circuit Court cases within the original jurisdictional amount of the District Court ) if counsel complies with CJP § 10-105 (a). Paid bills for goods or services are admissible without testimony as to the authenticity of the bills for goods or services or testimony regarding the fairness and reasonableness of the charges for the goods or services. CJP § 10-105 (b)(1)(i). The fact -finder may attach whatever weight to the bills it deems appropriate. CJP § 10-105 (b)(1)(ii). Testimony from a witness is still required, however. The bill may be admitted upon the testimony of a person with personal knowledge identifying the original bill or a copy, identifying the provider of the goods or services, explaining the circumstances surrounding the receipt of the bill, describing the goods or services provided, stating those goods or services were provided in connection with the event giving rise to the action, and stating that the bill was paid. CJP § 10-105 (b)(2). Normally, this testimony may be provided by your client. A classic example of a situation in which this procedure would be useful is in the context of admitting a paid bill for a rental car in an auto tort case. Your client can lay the entire foundation required to admit the paid bill. This avoids the problem of trying to get a witness from the rental car company to appear for your case. Remember, using this section also requires service of a notice upon all other parties at least sixty days before the trial begins. CJP § 10-105 (c)(1). The notice resembles that which is used to admit records of health care providers under section CJP §10-104. It must include a list that identifies each bill and have attached to it a copy of each bill. CJP § 10-105 (c)(1)(i). For each bill, the list must include the name of the provider of goods or service , and the date the good or service was provided. A notice of service and the list that identifies each bill must be filed with the Court. CJP § 10-105 (c)(1)(ii). Admitting paid bills this way can save you many headaches and streamline the presentation of evidence by requiring fewer witnesses and less of the Court’s time. Proving the value of personal property. This issue often arises in District Court trials. I have seen it come up with personal property destroyed in an auto collision, in a flood or removed by theft, and I am sure there are other contexts in which it arises. Each time I have encountered this issue , my opponent has tried to convince the court that an expert was needed to opine as to the value of personal property. Luckily, Maryland law contains no such requirement. An owner of personal property is competent to offer an opinion of the value of his own property. “It is well settled in this State that an owner of personal property in common use may express an opinion as to its value without qualification as an expert.” Christian v. State, 65 Md.App. 303, 307, 500 A.2d 341, 342 (1985), affirmed on other grounds, 309 Md. 114, 522A.2d 945 (1987); see also, Maryland Casualty Co. v. Therm-O-Disc, 137 F.3d 780, 786 (1998). This is true in civil and criminal cases. Christian, 65 Md.App. at 307, 500 A.2d at 343. Additionally, “the fair market value of common consumer goods… will usually be close or equal to their replacement cost.” Maryland Casualty Co., 137 F.3d at 786. This means that your client who lost a GPS unit, compact discs, or a new lamp in a collision can present her claim for damages for these items to the court without the need for a costly or difficult to find expert. Most courtrooms in the District Court of Maryland are equipped with exhibit stickers located at counsel table. It is always good practice to make sure your exhibits are pre-marked. With the volume of cases that are heard in the District Court, most judges want their dockets to move quickly and efficiently. Nobody wants to wait while an unprepared lawyer fumbles around attempting to mark exhibits in the middle of a trial. In my experience, this problem is most commonly seen where a series of photos need to marked (usually on the back so as not to obscure the image on the front). I keep a stack of yellow “Plaintiff’s Exhibit” stickers in my office so that I can have everything marked and ready to go before getting to the courthouse. At a minimum, take the time to arrive at the courtroom a few minutes early to mark your exhibits. A judge annoyed by delay is not likely to make a generous damages award. One ever present challenge in District Court motor tort cases is showing the judge how the collision happened. Most of us have seen this done in various ways: A description of the scene given by witnesses without demonstrative aids; a description made with magnetic car figures on a magnetized chalkboard, a drawing on a whiteboard or easel; or a description using grainy, out of focus snapshots. Each of these methods lacks clarity, specificity, or reliability. My favorite way to show the court where and/or how the collision happened is by using the official land records for the municipality in which the collision occurred or, now, Google Earth. These are usually available through the municipalities’ land records office. Records of this type have several advantages over the myriad other ways to convey the same information to the court. First, these records are self-authenticating as a certified copy of public records under Md. Rule 5-902 (a)(4). Second, they fall within the public records and reports exception to the hearsay rule. Md. Rule 5-803 (b)(8). Thus, they can be admitted into evidence without a witness, as long as they are accompanied by a certification from the custodian of records. These records make very effective trial exhibits. They can generally be purchased in a variety of sizes to show several vantage points. They are exact and are drawn to scale. This helps to minimize witnesses’ natural difficulty in estimating distances. Now, your witness will no longer have to guess or estimate how far away the other vehicle is when they first saw it or, for example, how far the defendant got through the intersection before the collision. These factors can more easily be determined by pointing to the plat and using a ruler to determine the exact distance. Using these records as trial exhibits takes the confusion and guesswork out of showing exactly where and how the collision occurred. 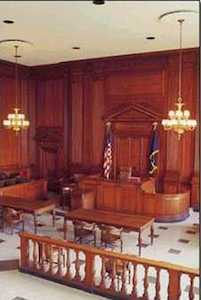 Many types of claims are heard in the District Court. They range from torts, contracts, landlord-tenant matters, to injunctive relief. Because the bench is confronted with such a wide range of types of claims, I find it helpful to arrive prepared to educate the court about the particular law that applies to the matter at hand. Usually, this takes the form of a trial Memorandum. This is nothing more than a brief memorandum in pleading form containing all of the law that applies to the matter, whether statutory or caselaw. It is important to understand this is not an opportunity for advocacy. A trial memorandum should not contain any factual material or application of the facts to the law. It is designed solely to make sure the Court understands the legal issues involved. I have used trial memoranda to explain issues such as res ipsa loquitor, trespass as to land, and the notice requirement in premises liability cases. This way, once you have put on your evidence, the court will be able to readily apply the facts to the law and render a decision. Although the trial memorandum itself is not advocacy, it is likely that you will have the Court’s full attention to your argument having made an impression with your thorough preparation. Additionally, if there is a case or statute that is particularly applicable, it is always a good idea to arrive with copies for the Court and opposing counsel. The same holds true for exhibits. Obviously, there is no requirement that you provide a copy to opposing counsel, but the principles of collegiality, professionalism, and civility make this a good practice. Professionalism always enhances your presentation and reputation. Also, keep in mind any potential appeal. Under Maryland Rule 3-522, in "a contested trial, the judge, before or at the time judgment is entered, shall prepare and file or dictate into the record a brief statement of the reasons for the decision and the basis of determining any damages." So if a judge does not give the basis for his ruling, you do not want to press it. The failure to comply with this rule provides a good basis for appeal. These tips should help to maximize the effectiveness of your District Court trial presentation. Hopefully, they will aid in preparing an organized, professional, and compelling presentation. Each of these techniques is designed to minimize the attention the court must pay to legal, procedural, and evidentiary issues so the focus of the trial can be directed where you want it.